For a lot of Americans, we share a bond of “Where were you when…?” and fill in the blank for some nation-altering event. Where were you when you heard Pearl Harbor was bombed? When you heard JFK was shot? When Neil Armstrong stepped out of the lunar lander? When you first heard 9/11 was happening? Depending on your age, maybe you weren’t born yet, or not yet cognizant of certain national tragedies and triumphs. At some point in college, I decided I should not date anyone born before the JFK assassination or after the first moon landing, the rationale being: I debuted about halfway between those events, and if we never have anything else in common, at least we both were around (or not around) for those events. And here’s where it gets surreal. I, completely unaware of what had actually just happened, jokingly said, “Yeah… and it crashed and blew up!” Mary didn’t believe me, so I urged her to walk around the corner to the TV lounge where a group of students were watching the launch… or rather, they were watching the horrifying aftermath. And my jaw dropped further than it ever had before. Some joke. I felt a pang of guilt for several hours after, wondering if I had caused the disaster with my flippant remark. I decided that it was way too egotistical of me to assume I had that kind of power, and got over the guilt. 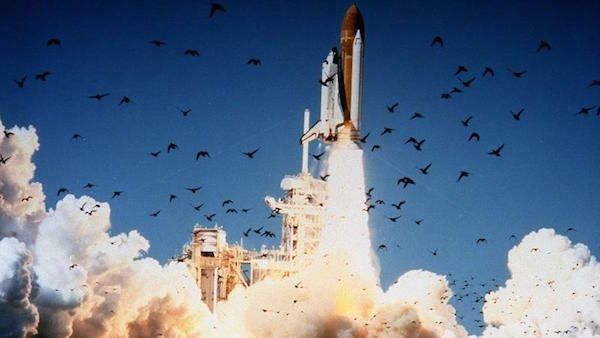 In retrospect, it may have been the first joke ever told about the Challenger explosion. So that’s where I was 31 years ago today. Funny how you remember stuff like that. Author Ron RuellePosted on January 29, 2017 Categories MusingsTags Musings, Too Soon! Previous Previous post: ¡Punctuation and Grammar Need Work!